JMeter is an Apache product which is used for load testing tool for measurement and analysis of performance of variety of services by focusing on web applications. This is a tool guide which is based on an integrated development environment (IDE) for checking quality as well as for recoding, debugging and testing the interactive soft-wares that works or designs for web based environment with the aid of automation. It is a portable testing framework as per authenticated by most of the software engineers and experts that is primarily designed for web based applications. JMeter can be helpful as a unit testing tool for JDBC database connections, LDAP, JMS, HTTP, web services, FTP, OS native processes and generic TCP connections. JMeter can also be used to build ad hoc monitoring as well as for some functional testing. JMeter looks variable parameters, response validations, cookies per thread support with configuration of variables and variety of reports. Its architecture works through plugins. Mostly unique features are implemented through different plugins. It is an open source tool that can easily be customized by the off-site developers through custom plugins. JMeter can be used to test performance of both types of web services like static and dynamic. JMeter testing tool guide certification program from Brainmeasures is the most valuable and suitable online certification program which will enable you to become more proficient and skilful in load testing with IDE, its testing requirements, universality, harmonization and synchronization with other web based applications and programming languages. This JMeter testing tool guide is a unique and compact certification program which will enhance your expertise and efficiency in terms of testing, measurement, checking and debugging in web based applications as well as effective use in different operating systems with multiple plat-forms of web browsers. After gripping on JMeter and know how about setting and debugging, candidates will further learn and practice in advanced topics of JMeter which are beyond to IDE environment. This all requires to get yourself enrol in Branimeasures JMeter program in order to get certification as equipped with expertise which will not only add in your Resume but also cause to increase your salary and chances to get promotion in your career path. Entitlement of JMeter tester, engineer, technician or analyst by the help of this certification program does not cause to develop and increase your expertise but also translates to increase in salary and wealth generation. The average annual salary for those who hold designing, engineering, IT auditing, developing and JMeter expert positions in an organization is $85,000 per year which can be grown in between $100,000- $140,000 based on level of experience as well as reputation of the employee and organization in the relevant field. 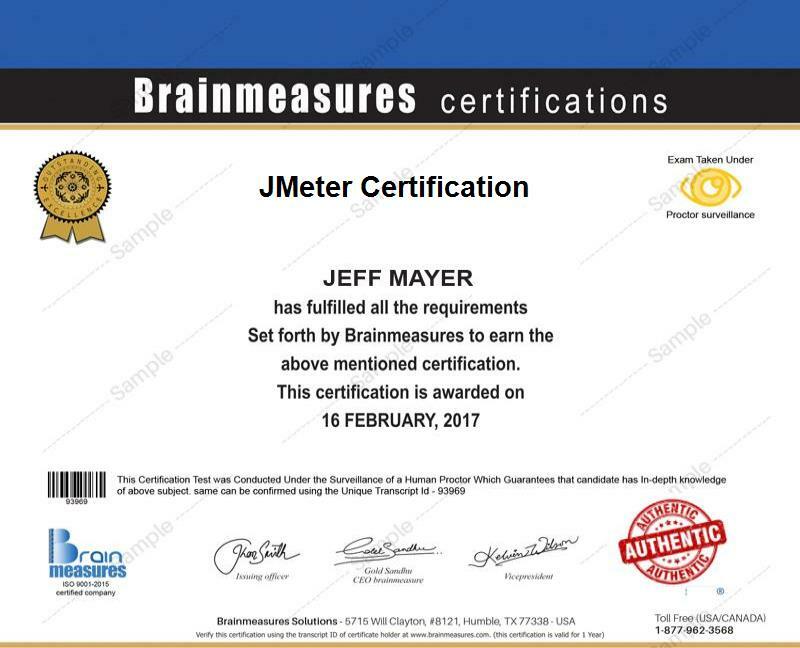 This certification program of Brainmeasures require some technical knowledge and expertise in web based environment but enrolment is open for all learners who are eager to enhance their competencies in the testing tools in JMeter environment. JMeter is designed for software engineers, developers, software auditors, IT managers, QA and QC developers and engineers as well as individuals, professionals and corporate players who wish to understand about JMeter, its IDE and API applications with enhancement testing skills.